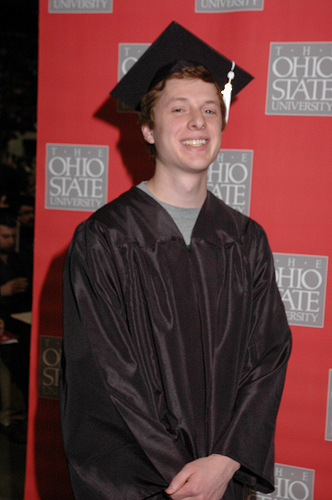 Becky and I are really proud of the fact that Matt successfully graduated from the Ohio State University. Even better, he graduated early, participating in the Winter Ceremony. So much has happened this spring that I’ve been unable to post the news until now – two short weeks before the Spring Graduation ceremony. People tend to think that OSU, being one of the largest Universities in the world would have an impersonal graduation ceremony. Getting thousands of graduates across a stage and receiving a diploma is an incredible feat. I’m not certain what happens in the larger spring ceremony – but the winter ceremony was very nice. All of the speakers kept their comments brief and appropriate. Donna James, managing director of Lardon and Associates, nicely delivered the commencement address. The staff is organized and friendly. Most impressively, the University President, Doctor Gee, shakes every graduate’s hand as they leave the stage. It’s an impressive accomplishment and he seems to genuinely enjoy the effort. In the weeks leading up to the event, it was clear that Matt felt the ceremony was going to be tedious. Getting a gown and cap was definitely a chore. But his Mother prevailed on him and let him know that most grads participated in the graduation ceremony for their family and friends and not for themselves. We do appreciate him sitting through the ceremony, and truth be told I think he did enjoy the event.